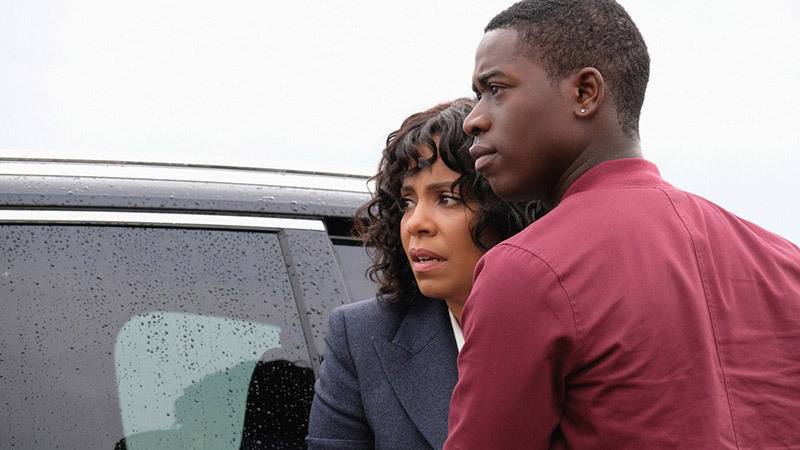 Following the second episode’s reimagining of an iconic episode, CBS All Access‘ third episode of The Twilight Zone explores police brutality and racism in “Replay.” Sanaa Lathan stars as Nina whose old camcorder can rewind time. 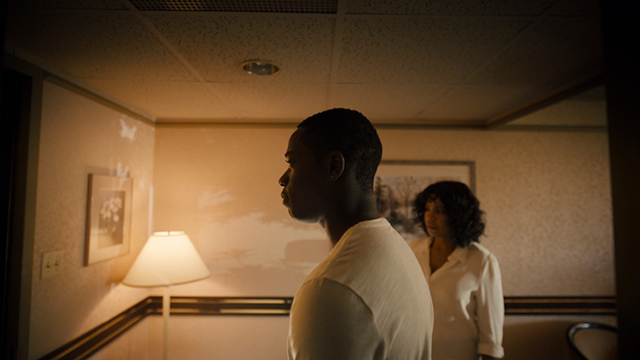 But can it help her ensure the future of her college-bound son Dorian (Damson Idris)? 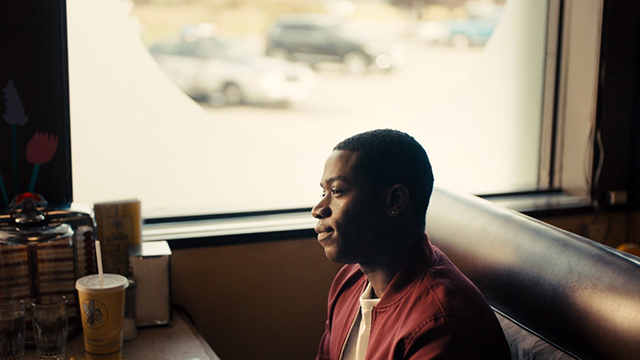 The episode begins with Nina and her son Dorian eating in a diner on their way to Dorian’s freshman orientation at college. The two discuss Nina’s own history and how her family felt about her leaving for school, including hinting at a volatile relationship with her dad. 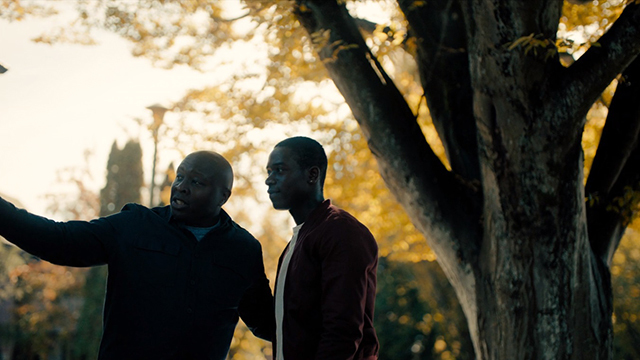 As they talk, Nina pulls out an old camcorder to capture Dorian’s “first steps into college.” Nearby, Officer Lasky (Glenn Fleshler) is introduced as he steps in for a bite. When Dorian grabs the ketchup for his fries, he ends up squirting some on his shirt as his mom is recording. Nina says she’s glad she has footage to show her future granddaughter (whom she wants to be named Trinity) of the slob she had to live with. Dorian tells her to rewind the footage and record over it. When Nina presses the button, though, time literally rewinds to just a few seconds before Dorian squirts the ketchup on himself, leaving Nina confused and wondering if it was all just an intense case of deja vu. 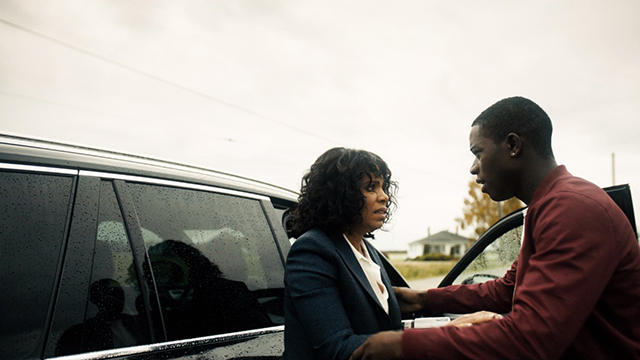 Jordan Peele officially introduces the episode, saying that Nina Harrison is a woman who left her past behind to provide a better future for her son. Thanks to her old camcorder, though, she’ll have no choice but to revisit history over and over. After Dorian rolls down his window for Lasky, Nina explains they’re taking Dorian to college. Lasky immediately asks if they’re going to “the black school,” and if there are any weapons in the car. As the tension rises, Dorian repeats that they’re just going to college. Lasky says that he saw Dorian operating a device while driving. He spots the old camcorder and demands to know if it’s recording. Suddenly, Lasky reaches in the car, screaming to turn it off. Nina tries to comply and ends up pressing the rewind button, taking them back to when Dorian first picked up the camcorder to film his mother in the car. Nina begins to freak out over moving back in time again, realizing this isn’t just deja vu. Dorian pulls over, with Officer Lasky pulling up behind them. As Dorian asks for help for his mom, who he thinks needs a hospital, Lasky tells them that they are illegally parked on the highway. Lasky refuses to help until Dorian moves the vehicle. Dorian gets upset, approaching the officer who pulls out a taser gun. 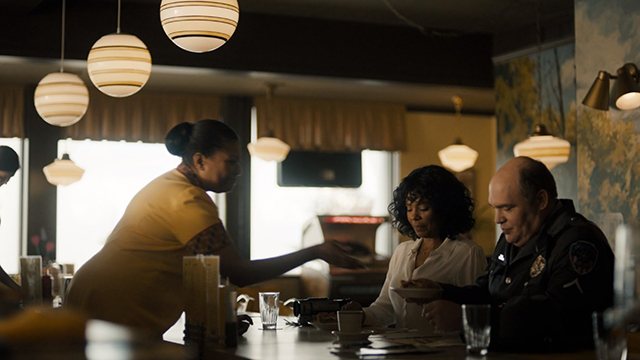 Before he can shoot Dorian with it, Nina hits the rewind button on the camcorder, sending them back to the diner. Dorian and Officer Lasky have no idea that they’ve moved through time. Nina rushes Dorian out of the diner, getting in the driver’s seat. She decides to take a different route to the school, saying she knows a longer but safer way there. After Nina calms down, she and Dorian talk about his future and he says he wants to inspire people with his films which is why he’s a film major. Nina says she could use a good night’s sleep and wants to stop at a motel for the night and drop Dorian off the next morning before orientation. At the motel, they watch the local $20 million lottery drawing. Nina casually starts recording it while she and Dorian discuss the probabilities of the lottery. Dorian believes that everything in the universe is destined to happen “the way they should.” Nina hits the rewind button once more. Having only gone back a few seconds, Nina makes a bet with Dorian: If she can guess the lottery numbers correctly, he has to promise to visit often. Dorian is stunned when she “guesses” every number and goes to get some snacks. Unfortunately, Dorian is met at the door by the racist Officer Lasky who has followed them to the motel. He says there was supposedly a noise complaint and demands to see their I.D. Dorian says he knows his rights as Nina brings up the camcorder. Again, when Lasky sees it he loses it. Lasky throws Dorian up against a wall, smashing him into a framed picture and pulling out his weapon. Nina screams and presses the rewind button, all three of them zapping back to the diner. Nina, not sure how to make Lasky back off, decides to approach him directly. She introduces herself and offers to buy the officer a piece of apple pie to thank him for his service. Lasky says that he can’t turn down Mabel’s delicious apple pie and the two sit down together, making small talk. Lasky asks if they’ve met before since she knew his name and he knows “everyone like [her]” in town. Nina says she’s just taking her son to Tennyson College and that he’s a film major and that he’s all she has. After talking a bit about how she used to grow up in the area and repeats that Dorian is very important to her, Nina spots Lasky’s wedding ring and asks about his wife. He says that sometimes life doesn’t go how you would expect, and she apologizes. Lasky later follows Nina and Dorian out to their vehicle and demands to see proof of ownership, apparently not believing that Nina worked hard to get it and her son into college. Fed up over all of the harassment, Nina grows angry and demands to know why the car wouldn’t belong to her. Dorian grabs his phone from inside of the car, saying he has a photo of the pink slip. When he tries to bring the phone out to the picture, Lasky shoots him and Nina drops the camcorder. At the hospital, Nina dreams about her son, older, playing with his two kids as she watches on. In reality, Nina is crying alone when the medical examiner says she needs to identify the body. Nina asks where the camcorder is and that she needs it before walking into the morgue to identify Dorian. Once she’s alone, Nina hits the rewind button, begging for it to work once more. It works, slamming her back in the diner booth and with Dorian alive again. After getting back on the road, Nina begins crying and Dorian thinks it’s because she’ll miss him. She decides to tell Dorian the truth and asks for his help. Dorian listens to Nina’s tale, contemplating how to help his mom break this loop of harassment involving Lasky so they can get to the school safely. Dorian then says: “There’s nothing magical about knowing the only way we haven’t taken can get us to the school.” He then programs the GPS to take them to Uncle Neil’s house. They need to go back to her home. Once they pull up to Neil’s house, Nina explains she never came back because her older brothers were killed there. One was shot down the block. Leaving meant staying alive. Uncle Neil (Steve Harris) greets his nephew and sister. As Dorian goes to collect the Black Panther comic Neil has waiting for him, Neil tells Nina she could have come back home for their dad’s funeral. As they talk inside, Nina explains she needs help before showing her brother the old camcorder that used to belong to their dad, saying she thinks it’s magic. She explains that no matter what, they can’t get past Officer Lasky. Neil says he believes her. As the family bands together to get Dorian to school and avoid Lasky, Neil reveals that he has a map of the area he’s been using to work on a remembrance project as he documents and interviews the black people who grew up in the area. Using an old drainage system, Neil is able to guide Nina and Dorian to the college. Lasky finds them there, though, pulling his gun on the three. Neil and Nina stand strong in front of him as more officers show up. Nina brings up the camcorder and Dorian tells his mom to rewind so they can try again. She says no, not this time. As the crowd brings up their cellphones, all recording along with Nina, she says they are witnesses, and that the harassment, targeting, profiling, and abuse of authority is over and that her son will cross the gate into the college. She tells Lasky to back off, who points his gun at Nina. As the crowd stands strong with Nina, the other officers leave. 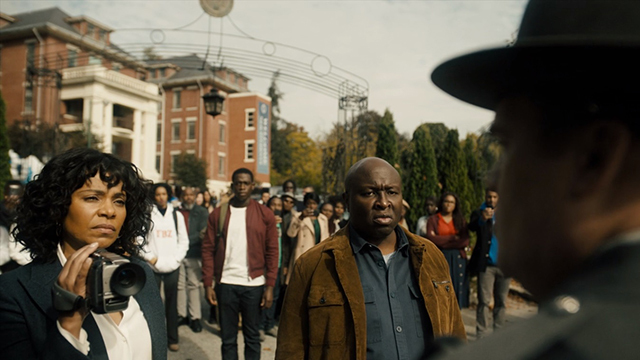 Nina tells Lasky that he’s the one who’s afraid before he finally puts his gun away and they all watch as Dorian crosses the college’s gates. Moving forward in time 10 years, Nina is recording an older Dorian with his young daughter, Trinity. Dorian tells her she can stop recording. Trinity grabs the camcorder to play with it and accidentally drops it, breaking Nina’s safety net. Dorian tells her it’s time to let it go, though. It’s been a decade. As Dorian steps out to grab them some ice cream, Peele closes out the episode by saying that only by embracing her past was Nina able to protect her son’s future: “It was love, not magic, that kept evil at bay.” However, as lights flicker across Nina’s face from outside, Peele continues: “But for some evils, there are no magical, permanent solutions and the future remains uncertain.” The screen goes to black as a siren goes off. What did you think of the third episode of The Twilight Zone? Let us know in the comment section below!